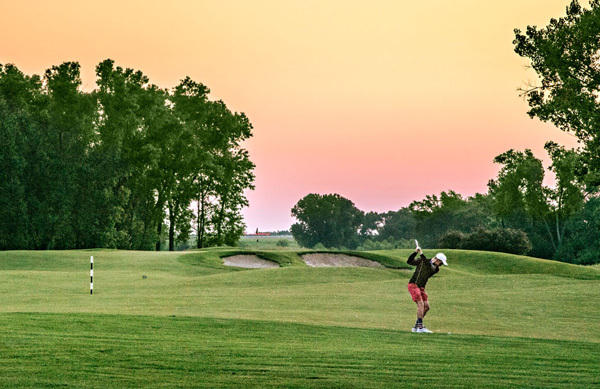 Play your way through grass-covered dunes and picturesque prairie landscapes at some of Kansas' best public golf courses. Sand Creek Station, Newton Five sets of tees at each hole ensure playability for all levels on this course known for its interplay with water hazards (four holes border Sand Creek). Buffalo Dunes, Garden City A swath of modest sage - and grass-covered dunes creates a unique golfing landscape with numerous sand traps. Factor in a prairie breeze and you'll find out by the end of the first hole why this moderately hilly course is more challenging than it looks. Colbert Hills Golf Course, Manhattan A slice of the undulating Flint Hills forms an 18-hole course co-designed by PGA Champions Tour player Jim Colbert. Native prairie tallgrass borders treeless fairways dotted with white and purple sand bunkers honoring the colors of Kansas State University (less than 4 miles southeast). Prairie Highlands, Olathe Wide-open spaces, ponds and 160 acres of native grasses highlight this suburban Kansas City course. Dine on the patio at the clubhouse's bar and grill while taking in views of the prairie. Firekeeper Golf Course, Mayetta Sole Native American PGA Tour champion Notah Begay III designed this par-72 course while honoring the Potawatomi tradition of respecting the land. The first seven holes wind through prairie; the next 11 snake around natural creeks and hills.